I don’t often talk about my own projects on Lines and Colors, but sometimes they’re enough fun to be worthy of note. PumpkinMixer is my new app for the iPhone and iPod touch. Like my other apps, DinoMixer and MonsterMixer, it was developed with my friend and colleague Leon Stankowski, who created the coding to fit with my design and illustrations, worked with me on the functionality and coordinated the sound. Similar to the other “Mixer” apps, PumpkinMixer is based loosely on the old Surrealist game of Exquisite Corpse, in which artists would fold over paper and draw three independent parts of a drawing, head, body and legs, without seeing the outcome until all were in place. This concept made its way into popular culture as a children’s game (my friends and I played it in elementary school), and was eventually adapted in publishing as “mix-n-match” children’s picture books (usually spiral-bound, with stiff cardboard pages that are divided in three). PumpkinMixer, like DinoMixer and MonsterMixer, is an electronic version of this. 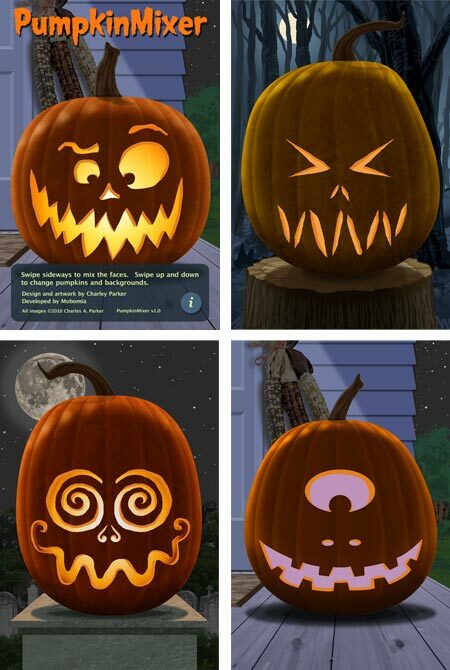 In the case of PumpkinMixer, you swipe side to side to swap sets of eyes, noses and mouths, with an extra horizontal band at the top to switch between three backgrounds. Swiping on the iPhone screen vertically switches between pumpkins and swaps out the colors of the animated “candle flame” behind the face cut-outs. In designing the interface and creating the artwork, which was done digitally in Painter and Photoshop in the same way I draw my webcomic, Argon Zark!, I faced the same challenges I outlined in my post about creating the artwork for DinoMixer. Like many illustration projects, this one, in addition to the design and technical challenges, had a deadline. Since PumpkinMixer just made it through the App Store approval process and became available today, one day before Halloween, you might say we just made it; though we obviously had an earlier release in mind. On the other hand, you could say we’re just really really early for next Halloween! Tim, a Lines and Colors reader, wrote me to say that he had recently become inspired to return to the practice of drawing. 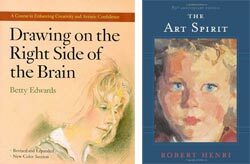 He had purchased a copy of Betty Edwards’ Drawing on the Right Side of the Brain (see my post here), and was looking for other books and resources to pursue his interest from there, hopefully with a classical or Renaissance method. Edwards’ book is an excellent place to start for someone who has a new or rekindled interest in drawing. 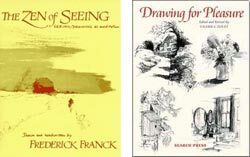 I frequently recommend it as the book concentrates of the fundamental and most difficult problem adults face in learning to draw, and that is learning to see what is actually before them, and not what they think they see. I feel her book, however, is lacking the other “half” of drawing, the art of it, the finesse and artistic choices that separate “art” from “just drawing” and that separate the masters from the ordinary. 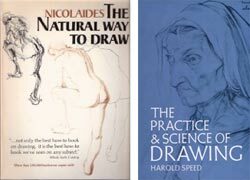 Though she has attempted to address this somewhat in recent editions, there are better sources for pursuing the art of drawing. This is not meant to be a comprehensive list, certainly not of drawing books, or even of drawing books and resources that answer the particular question at hand, but a few suggestions drawn (if you’ll excuse the expression) from my personal experience. A book I will recommend, though it is not specifically related to drawing but to art and art study in general, is Robert Henri’s The Art Spirit. As for drawing instruction in a classical or Renaissance method, there isn’t a great deal in the way of drawing texts from the Renaissance; techniques were passed down from master to apprentice, rarely committed to writing. Modern representational drawing texts concentrate on Academic teachings, which are derived from principles developed in the Renaissance and subsequent years up to the late 19th Century. 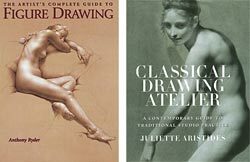 Classic drawing textbooks (not necessary “Classical”) These two volumes have been standards in art schools in the U.S. for decades. Look for them used online, in used bookstores or on eBay; they’re overpriced and current printings are apparently of poor quality. If you’re really committed, Kimon Nicolaides has the game plan, but it’s a demanding course of study. I had the good fortune to have Robert Beverly Hale as my artistic anatomy instructor when I was a student at The Pennsylvania Academy of the Fine Arts. His teachings have been codified in a series of books, illustrated with selections of old master drawings. 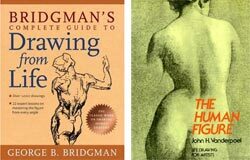 Put solidity and an understanding of form into your figure drawing with Bridgeman and Vanderpoel. Look for used books of collections of master drawings, study them and copy from the masters (as they did from previous masters) to understand what they have done with line, tone, space and form. 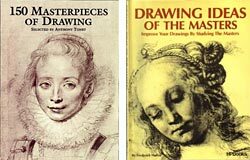 Dover Books has many titles with master drawings that are inexpensive new. Though the reproduction is not superb, they are still very good for study and enjoyment. Look to your local library for everything mentioned here and more. If you live near a state university, you may find their library open to residents, including borrowing privileges. Line by Line is an introductory drawing course running in weekly installments on the New York Times (see my post here). There are many other online resources that should be the subject of a separate post. Seeing old master, Baroque and 19th Century drawing in person is a treat, inspiring and very instructive. Drawings reveal their subtleties in person even more than paintings. They can’t be kept on display because of light damage, so you have to look for shows. On the East Coast of the U.S. The Met in NY and the National Gallery in D.C rotate out selections from their collections of works on paper in small dedicated galleries. Look for other major museums to have similar small spaces devoted to works on paper. The Morgan Library in NY often has great drawing shows. This is a directory of life drawing (figure model) open sessions, workshops and other easily accessible classes: Figure Drawing Open Studios, Workshops, and Continuing Education Classes, see my post on the Directory of Figure Drawing Sessions. Pose Maniacs, Virtual Pose and Figure Drawing training Tool let you practice life drawing from home, the former with computer generated figures, the latter two with photographs. The most important thing: keep drawing. If it’s not a dedicated course of study, make it a hobby, a habit, a coffee break, a meditation. A quick sketch once a day is better than an elaborate plan of study that you can’t maintain. 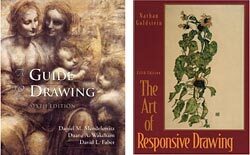 This is an essay on drawing, and the special kind of seeing associated with drawing (that I think is at the core of the techniques in Drawing on the Right side of the Brain and other texts) as a form of meditation. 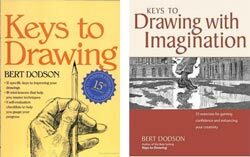 More importantly, it is instructive in drawing as a practice, an activity, something you do, rather than something you are trying to accomplish. It’s hard to overstate what a dramatic difference in frame of mind this seemingly small shift can make. I mention this title, not because the drawings within are treasures of old master accomplishment — they’re not, but because of the attitude and approach expressed by the book and its title. Unless you mess it up by trying too hard, hanging all kinds of expectations and self-measurement on it or make the gross mistake of comparing your current level of ability with others, drawing is, after all, fun. So my best word of advice? Draw and have fun drawing. The rest will follow. [Addendum: On rereading this post, I wanted to add one of my favorite quotes. Drazen Kozjan was born in Croatia and now lives in Canada, where his family moved when he was young. His career has included visual development and storyboarding for a number of features, including The Neverending Story, Rupert the Bear, Franklin The Turtle and George Shrinks. He is also an editorial illustrator and children’s book illustrator, with credits for several books, including The Biggest Girl In the World by Joanne Stanbridge, Diary of a Fairy Godmother by Esm Raji Codell and How to Tame a Bully by Nancy Wilcox-Richards. Kozjan’s crisp, spare style manages to be evocative without ever being labored. His interior book illustrations are often done with fine line and deft touches of tone. His color illustrations, in contrast, frequently feel like they are line drawings with color fills, but are often accomplished with sharply delineated forms instead of outlines. He works in pen and ink, marker pens, gouache and watercolor, as well as digital media, specifically Photoshop, in which he colors most of his recent work. His website has galleries for individual book titles as well as other work. Kozjan also maintains a blog called Hypnotik Eye, in which he discusses his projects and posts personal sketches and life drawings, along with occasional mentions of other artists from the history of illustration whose work he admires. You can also see his portrait of Rod Serling on Hey Oscar Wilde, It’s Clobberin’ Time! (see my post on Hey Oscar Wilde, It’s Clobberin’ Time!). There is a recent interview with Drazen Kozjan on Fuel Your Illustration. Glenn Jones, a freelance illustrator and graphic designer based in Auckland, New Zealand, creates deceptively simple images that always have a twist or hook, usually leaving you smiling if not laughing out loud. After a 15 year design industry career, Jones found that his T-shirt designs for Threadless.com were so successful that he started his own line, GlennzTees. His website splits into his personal website, the Genns Tees store, and his Behance Portfolio (also here), along with links to his pages on Facebook, Twitter and Flickr. You can also find example of his work displayed on Digital Art Empire and Design your way.